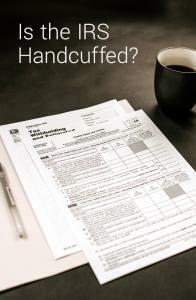 Is the IRS Handcuffed to Offer Better Services? I heard a report on NPR this morning and it just didn’t sit right with me. With it being tax day – a national holiday worthy of a day off and celebrations everywhere – I thought I would share. According to a report by ProPublica – there is a bill making its rounds around Congress which would effectively bar the IRS from offering a free tax prep service that would compete with TurboTax and other third-party tax software. While TurboTax and others tout “free” tax prep – many people end up paying something for the service because of income levels. According to the report, just 3% use their services for free (this is amazing to me given how much they tout their “freeness” in ads and marketing). Often we think the government is acting in the best interests of the public. But, given the amount of money paid to corporate lobbyists, this is not always true. Often, government favors corporate interests. And, to some extent, I can see the positives in this. Corporations employ many American’s. And because of this – it is why many of us enjoy the life that we live (higher wages, ability to own a home, vehicle, etc.). So, I don’t want to villanize corporations. Yet, when I see or hear about something – like the current tax system – which can be made easier and more efficient, but is somewhat handicapped due to lobbyists, it is a bit irritating. Isn’t there free file with the IRS? Currently, there is an option to free file with the IRS – but your income must be under $66,000. According to the IRS, 100 million tax payers can use the free file program (that’s 70% of filers). The IRS does send users to different tax prep services off their website – so it’s somewhat hard to say how many end up paying something for the service. I am more interested in hearing about your thoughts on this. Would love to hear if anyone is a tax prep professional or accountant to get their thoughts on the matter. My own thoughts are that if we can make this season more efficient for everyone, why aren’t we doing it. It’s been reported that in many countries, residents receive their tax forms in the mail, already pre-filled out with their information and income (because the government already knows what you are making). Would that make it easier?